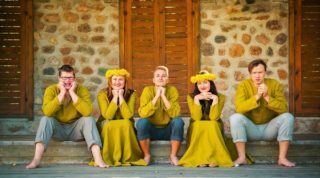 Rikši, a post-folklore ensemble from the Latgale region of Latvia, have now been performing in their own inimitable, quirky style for more than five years. Humor is an essential aspect of their songs, along with creative and unusual approaches, and it has resulted in some of the most distinctive recordings in Latvian music. The group released their first album Pa pyrmam in 2014, and followed that up in 2016 with their second record, Sieju sovu. Rikši, who are an offspring of the Rēzekne based folk group Vīteri (who are also known for their offbeat and humorous performances), counts five members, all of whom are vocalists. In addition to vocals, Ēriks Zeps provides accordion, Zane Dukaļska is on percussion, Madara Broliša plays the violin, Ivars Utāns performs the bass, and Mārcis Lipskis provides the guitar. Though there are still many modern elements in their performances and arrangements, Rikši are still firmly based on traditional folk elements from Latgale, and almost all the songs on the record are in the Latgallian dialect. This is clear from the first song on the album, ‘Sieju rūtu, sieju mātru’, which features the women from the folklore group ‘Rūta’, based out of Rēzekne. In fact, the songs included on this album are all taken from Rūta’s repertoire. As they have matured, Rikši’s arrangements have become more intricate and varied. The Roma influenced ‘As čyguona sīva beju’ has extensive a capella vocal harmonies in this vibrant rendition of the song of a gypsy’s wife. Additional harmonies, as well as interplay between the men’s and women’s voices can be found in ‘Oruojeņi, acātuoji’, a song about working in the fields. Though many of their songs are lively and cheery, Sieju sovu does contain some slower, more serious numbers, such as the somber ‘Muote dieleņu auklieja’, with its limited, sparse arrangement, as well as the appropriately tender lullaby ‘Šyupļa dzīsme’, with its lilting mandolin and accordion accompaniment. The melancholy ‘Pa kam var pazeit’, about a boy going off to war, is tinged with sadness as the whole family prepares for the boy’s departure, and provides for a very moving performance. 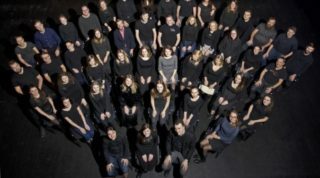 A review of their Facebook page reveals the group’s versatility and activity – performances throughout Europe and in the United States, as well as many events and festivals within Latvia. Rikši remain one of the most energetic and enthusiastic folk ensembles in Latvia today. With their creative and distinctive interpretations and arrangements, which they have continued and developed even further on Sieju sovu, the group has solidified their place in Latvian folk music. With both traditional and modern elements, as well as exuberant singing and playing, Rikši provide for both a lively and lighthearted listen. For further information, please visit the Rikši Facebook page.